I’ll do whatever it takes to close a deal while also protecting the best interests of my clients. I think through problems from multiple angles, focus on the smallest details and leverage every available technology resource to develop the most creative and cost-efficient solutions. 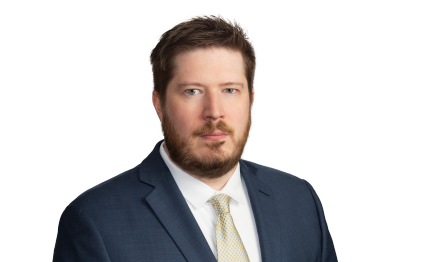 With significant experience in numerous areas of natural resources law, Ethan Wood advises upstream and midstream energy clients on the entire range of transactions and issues that arise during oil and gas operations in Texas and many states across the country. He has guided clients through a variety of multi-million-dollar deals and other operational transactions, with a strong emphasis on the acquisition, divestiture and financing of producing assets, private securities offerings, oil and gas leases and joint operating agreements. Ethan also conducts title examinations and renders opinions for producers with drilling operations throughout Texas and coordinates identical activities with local counsel in multiple jurisdictions, including New Mexico, Ohio, Pennsylvania and Oklahoma. As a former independent petroleum landman, Ethan has a unique perspective on the most important aspects of title examination, which allows him to focus on identifying practical ways for landmen to address issues quickly and proactively in the field. Assisted in drafting Participation Agreement and Joint Operating Agreement covering development of up to 47,000 net mineral acres in Chaves County, New Mexico. Assisted in drafting Participation Agreement and Joint Operating Agreement covering development of lands in Hardeman and Wilbarger Counties, Texas, and Jackson County, Oklahoma. Represented landowner in negotiation of groundwater lease. Drafted Assignments and Amendments of Overriding Royalty Interests, Loan Agreement, Title Indemnity Agreement, Consolidated Amended and Restated Term Note, Consolidated Amended and Restated Loan Agreement, Guaranty Agreement, and Consolidated Amended and Restated Deed of Trust for acquisition of note covering oil and gas properties in multiple Texas counties. Assisted in drafting Put Agreement, Production and Marketing Agreement, Personal Guarantee, Conveyance, Purchase and Sale Agreement and Termination of Amortization Exclusion Agreement for $400,000 Volumetric Production Payment covering properties in Kansas. Drafted Letter Agreement and Term Assignment for $65,000 sale of non-operating interests in Winkler County, Texas. Negotiate Permanent Easement Agreement on behalf of landowner in Ward County, Texas. Drafted Distribution Mineral Deeds for mineral properties in Ward and Winkler Counties, Texas, Lincoln Parish, Louisiana, Uinta County, Wyoming, and Summit County, Utah. Drafted Letter of Intent for contemplated sale of 49,000 net acres of leasehold in Chaves County, New Mexico. Drafted Distribution Deeds for trust properties in Lewis County, West Virginia, Christian and Macon Counties, Illinois, Vermillion Acadia and St. Landry Parishes, Louisiana, and Van Zandt, Hidalgo and Wharton Counties, Texas. Drafted Salt Water Disposal Wellbore Assignment. Assisted in Drafting Contract Operating Agreement. Assisted in Drafting Salt Water Disposal Agreement. Assisted in conducting due diligence for $685M Eagle Ford leasehold acquisition. Drafted and negotiated Purchase and Sale Agreement for $1.7M Eagle Ford leasehold acquisition.